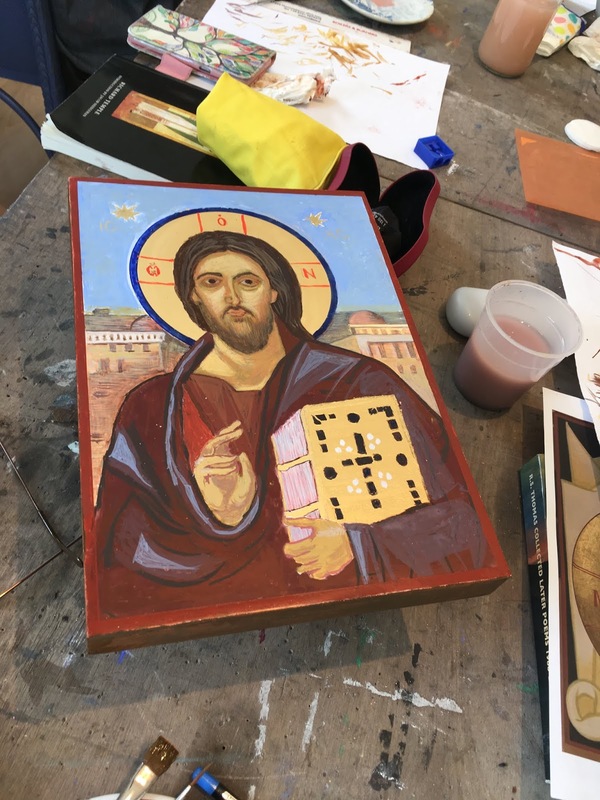 A couple of weeks ago, I went on an icon workshop. 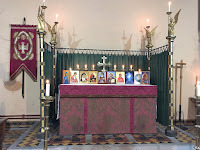 I spent four nights in one of my most familiar places, the Cathedral of The Isles on Cumbrae, doing something completely new; something that feels as life-changing as that January day in 1973 when I sang at the funeral of a friend who was also a priest and a mentor and came away changed for ever. The first milestone was choosing my icon. Tatiana, our teacher, had brought some illustrations for those of us who had not already decided what they wanted to copy. 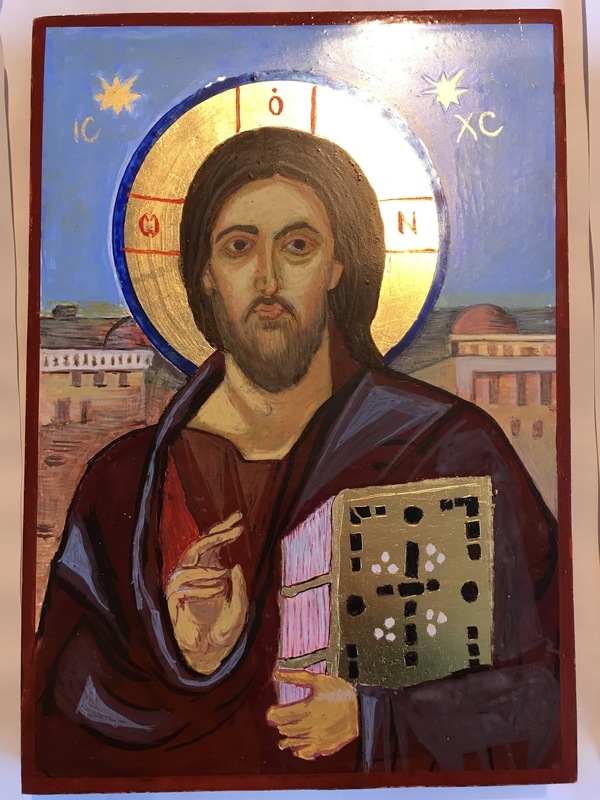 I had downloaded a few versions of the Christ Pantocrator icon, as well as a photo of one I'd loved when I saw it but felt unequal to trying - one of the Noli me tangere moment, all facial expressions and sweeping robes. 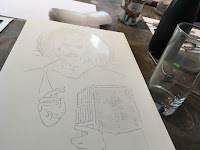 But when I saw the A4 sheet with a totally striking Pantocrator image, I was captured. Tatiana saw my face. "That is your icon," she said. She explained that it was very old - probably 7th Century - and came from St Catherine's Monastery in Sinai. And right now the less ignorant reader will visualise what I'm talking about, because it's famous. But I didn't know this. I only knew that the face was really two faces - one the stern judge, one empathetic, looking right at ME. I took the sheet away to my room. By the time I went to bed, I was aghast at what I'd taken on. 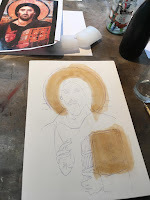 Work on an icon begins with tracing - at least, that's the way I took. Another person at my table, an artist in a way I could never claim to be, drew hers freehand with her original only for inspiration. 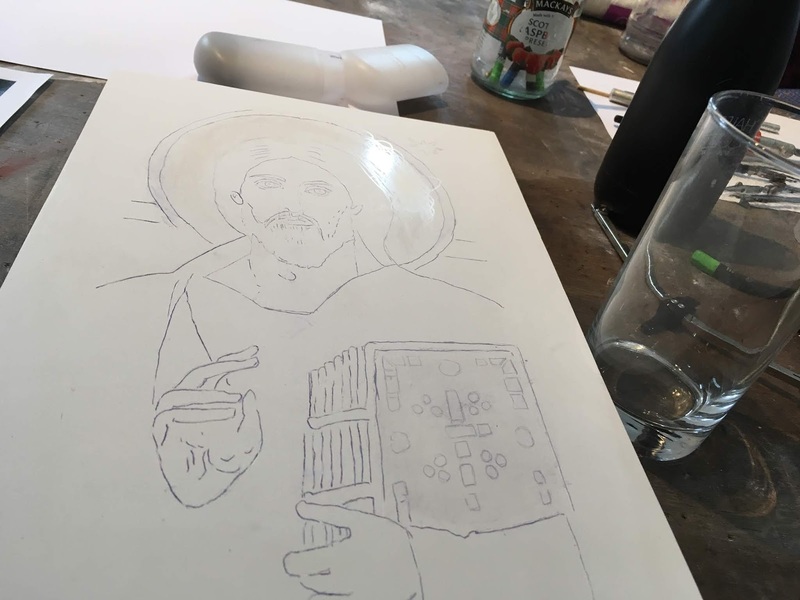 Me, I was out with the carbon paper, trying to trace significant lines from an icon that was far more naturalistic than any I'd ever seen. And I didn't make very many lines. Then we had to etch the lines onto the white surface of the prepared board. Hindsight tells me I didn't etch enough - too few lines, too lightly scored. 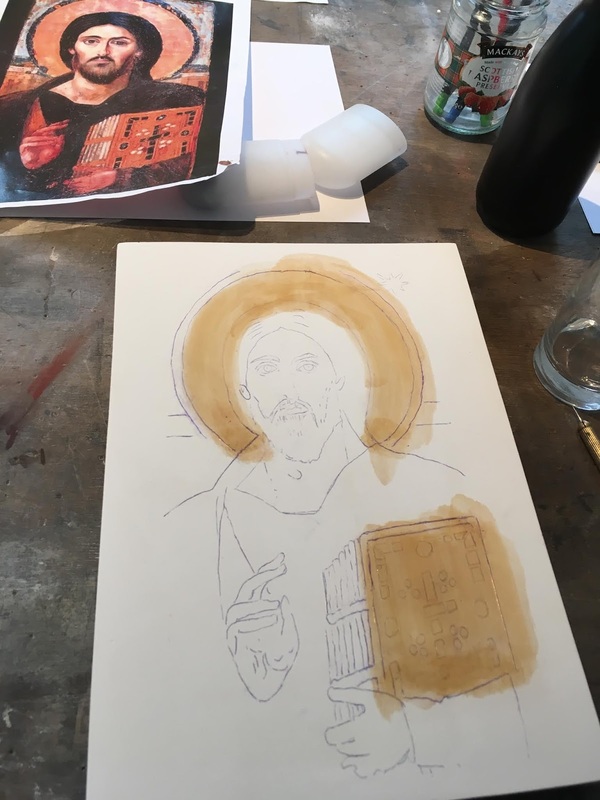 By the time I'd done the gold leaf halo and bible cover and "puddled" paint onto the garment and the face, I couldn't see any of the facial features. At all. "Leave it to dry,"said Tatiana. 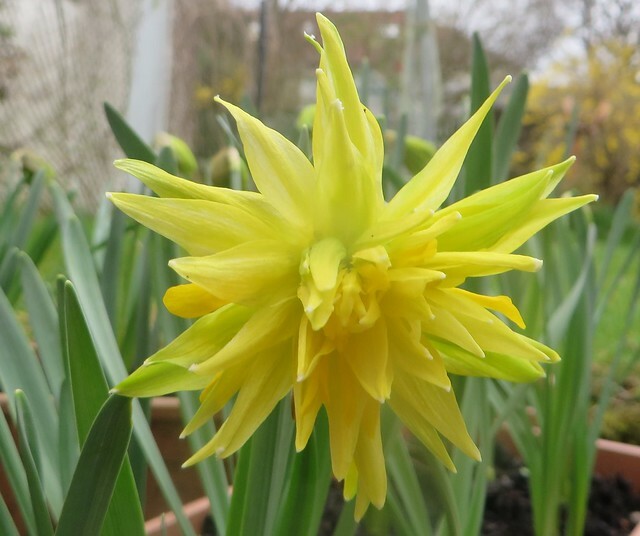 It'll probably be clearer in the morning - and the light will be better..."
I spent that evening chatting to an old friend who'd turned up - a musician, from my other life as a singer. 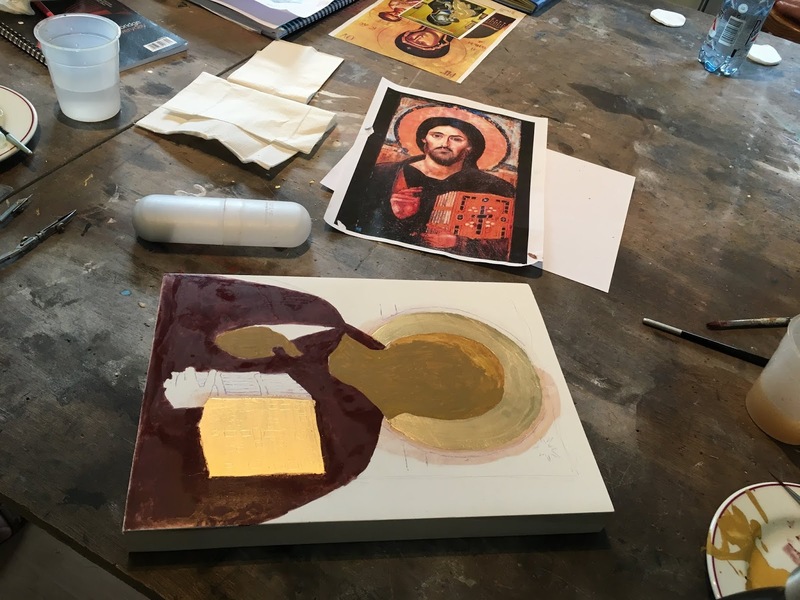 I told him how Tatiana had brought 3 eggs in a bowl for us to paint with - she broke them, separated yolk from white, took the whites back to the kitchen and left us the yolk with which to mix our pigment. I told him about the pipettes, the brushes, the feeling of being 14 again. Jonathan took my mind off my impending struggles, made me laugh - and I went to bed much later than I'd intended. The second full day began with rain, less sunshine than I felt I needed - and only an eye visible on the face of my icon. By some miracle I managed to draw more or less freehand, with a hard pencil, the lines I was going to need to guide me. 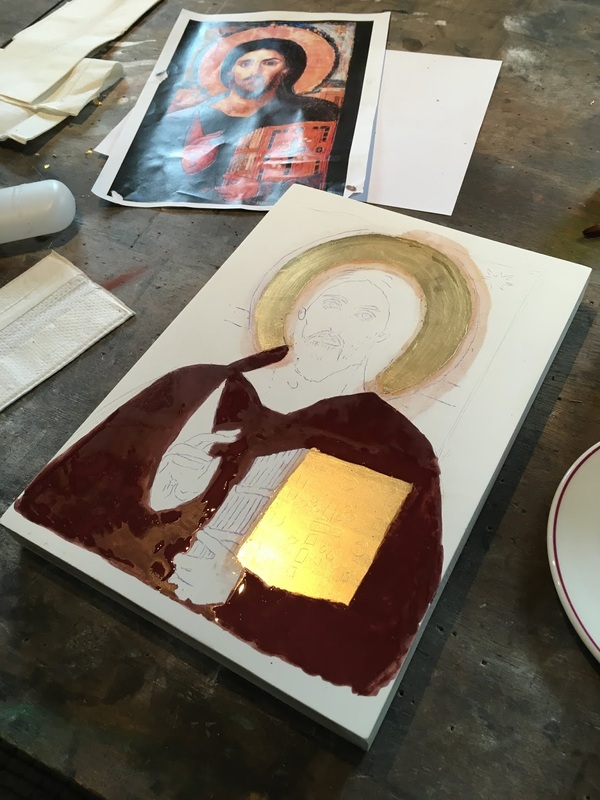 Then I returned to a more orthodox way of icon-writing, with brush and egg tempera and a plate to mix my pigment on. I felt like a real artist, in a terrified sort of way. 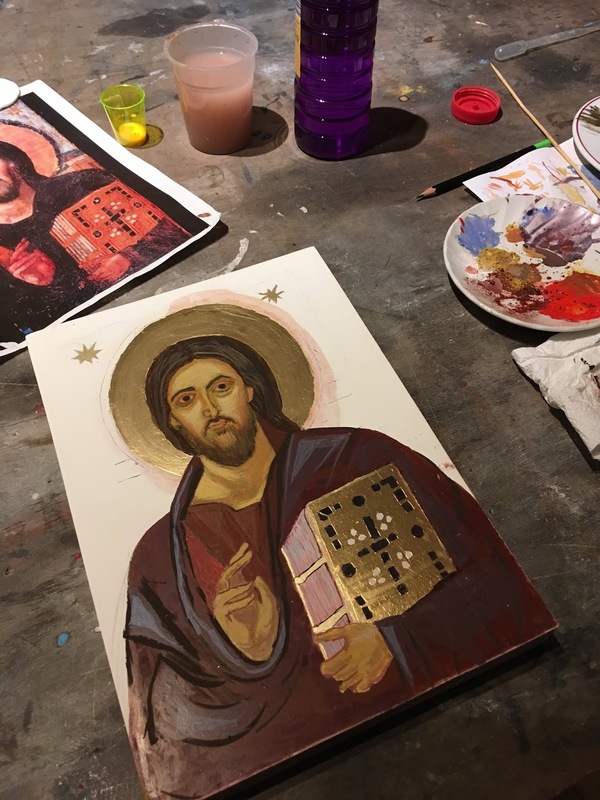 But I was on my way, and during that day, and evening - for some of us returned to the studio to continue painting after dinner - I began to see the face of Christ emerging under my hands. And it was that last realisation that grew throughout the third full day, by the end of which Titus, Tatiana's partner, had sprayed two of the necessary three coats of varnish - outside, in the gathering dusk, because of the fumes - on my icon, and it was almost finished. That day was spent on the background - which further research on YouTube has taught me shows the domes of the monastery of St Catherine, but which I modelled on the honey-coloured stone of an Italian town as I tried to realise what on the original was too blurred to be distinct - and on painting the border, and the sides and back of the board. 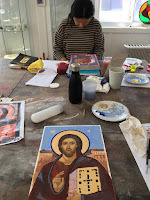 Every now and then, as I'd been warned I would, I wailed for Tatiana to come and help me with an intransigent line, or the miraculous effect of painting a wash of unadulterated egg yolk over a whole area of my icon and leaving it to dry. And all that time I felt those eyes on me, boring into me as I stroked pigment over the cheeks, highlights on the sleeves, shadows under the palm of the raised hand. The final morning was busy with varnish, photographs of each other's work, packing, paying - and praying. 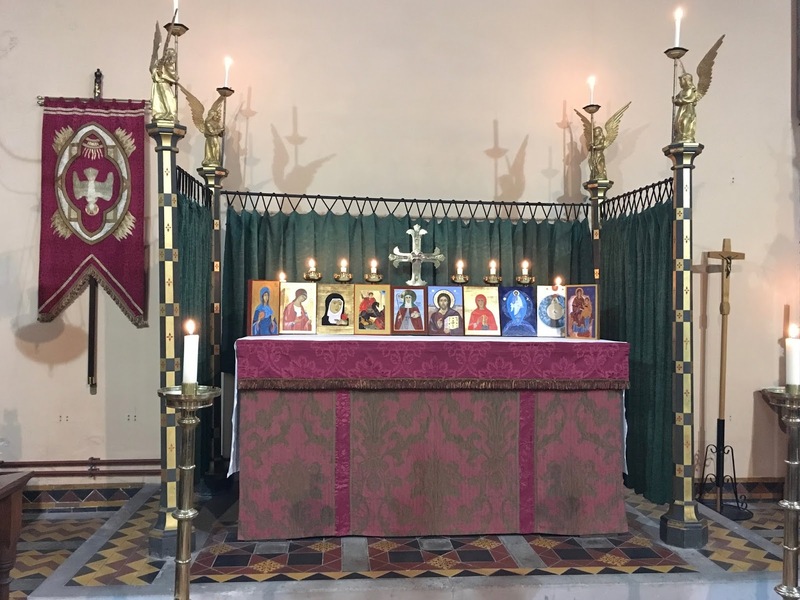 We took our finished icons into the cathedral, where they they were individually blessed with holy water before we took them up to the altar and left them there during the Eucharist. One of my fellow-iconographers presided; others served and read; my friend Jonathan played the organ for us. It was over. I have never felt more exhausted, physically and emotionally. I wanted it to go on, but I knew I was too tired to do another brush-stroke. Now my icon sits in an alcove in my house. I look at it every day. It has become a part of my life. And I can't wait to do another one. 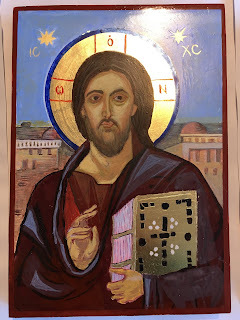 This entry was posted in Professional and tagged "Christ Pantocrater", "Icon drawing", art, Cathedral of The Isles, Christ, Christianity, Cumbrae, History, icons, painting, religion, Workshops on 5 September, 2018 by Christine McIntosh. A great daily create today, imo (disclaimer: I submitted the idea). 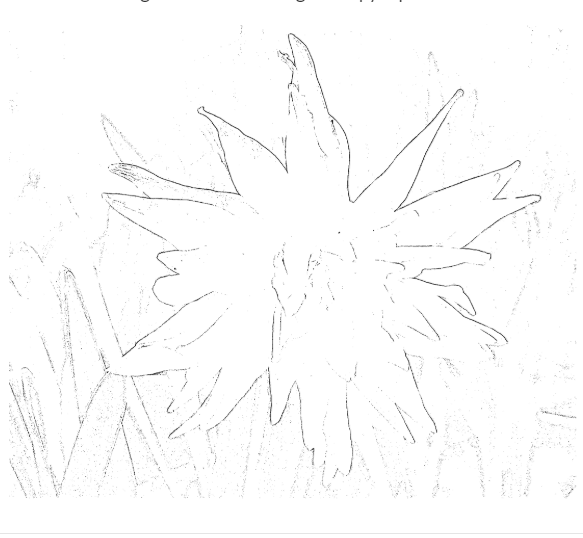 I took a photo of a daffodil that I took a couple of months ago and put it through an online app that turns photos into drawings, and messed around for a few minutes till I had an outline I liked. Then I printed it out and got out my pencil case. I could already see the makings of a beak and a scruffy body, and this is what appeared. This entry was posted in Professional and tagged #tdc2392, art, bird, DailyCreate, drawing, ds106, flowers, photos on 29 July, 2018 by NomadWarMachine. This entry was posted in Professional and tagged #share, action research, art, Blogging, differentiation, History, ICT, maths, Pedagoo, PedagooFriday, practitioner enquiry, Social Media, STEM, Technology on 27 May, 2017 by Lynne. 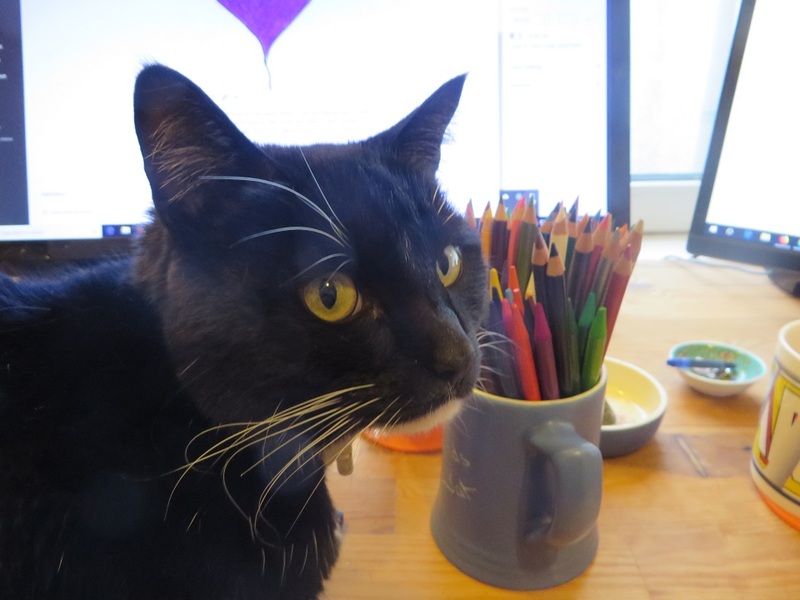 This entry was posted in Professional and tagged #ScotEdChat, art, creativity, drawing, English, Expressive Arts, Ideas, illustration, Leadership, learning, literacy, PedagooFriday, Primary, Professional Learning, research, Skills, writing on 18 May, 2017 by Susannah Jeffries. This entry was posted in Professional and tagged art, creativity, drawing, edubooks, kidlit, literacy, maths, number, numeracy, picturebooks, Primary, resource, teaching, writing on 27 October, 2016 by Susannah Jeffries. Question – What do shapes and underpants have in common? Answer – A maths/art lesson with some reading for enjoyment thrown in for good measure. At snack time I read my class the Aliens/Dinosaurs love underpants series of books by Claire Freeman and Ben Cort. The children loved the stories. This gave me an idea to have the children design their own underpants. As they were learning about shape and pattern I used this as a basis for their designs. The children had a choice of underpants and were able to create their design either by printing shapes or using coloured dots. I created washing lines to display the underpants, using craft mini pegs to attach the pegs to the string. This entry was posted in Professional and tagged art, lesson ideas, maths, teaching on 25 September, 2016 by AMWeston. Memes and animated gifs abound in social media. You don’t have to look too long online to see these appear, often being shared and shared by many people via their social media accounts, or prominent on webpages or blogposts to draw in the reader to find out more about a story or data. Having learners create their own memes or animated gifs can support their learning across all areas of the curriculum. The process of demonstrating understanding of a concept involves learners in reflecting on their learning, often discussing with others to test the depth of that understanding, and then finding creative ways to present the information to others. Where learners are encouraged to make these animated gifs or memes to demonstrate their understanding of concepts they are reflecting on what the key points are, they are summarising, in effect creating a visual précis of information. So what is an animated gif? Animated gifs are short animations lasting just a few seconds, sometimes just a sequence of related images, sometimes a short looping segment or clip of a video, sometimes a stop-motion style of inanimate objects brought to life to convey a message. And what is an image meme? Image Memes generally may consist of a single photograph with text along the top and foot of the image, sometimes black top and bottom borders where bold white text is superimposed. The text is often in capitalised Impact font. The text is usually very short and the text along the top can often be the draw to bring in the viewer, and then the text along the foot can spin the idea to make the reader reflect on the issue, often with humorous effect. Animated gifs and memes present messages in a visual, attention-grabbing way, to make those who view them stop and think. The most thought-provoking memes and animated gifs distil what can be a complex concept into the main idea which can be understood in just a few seconds. 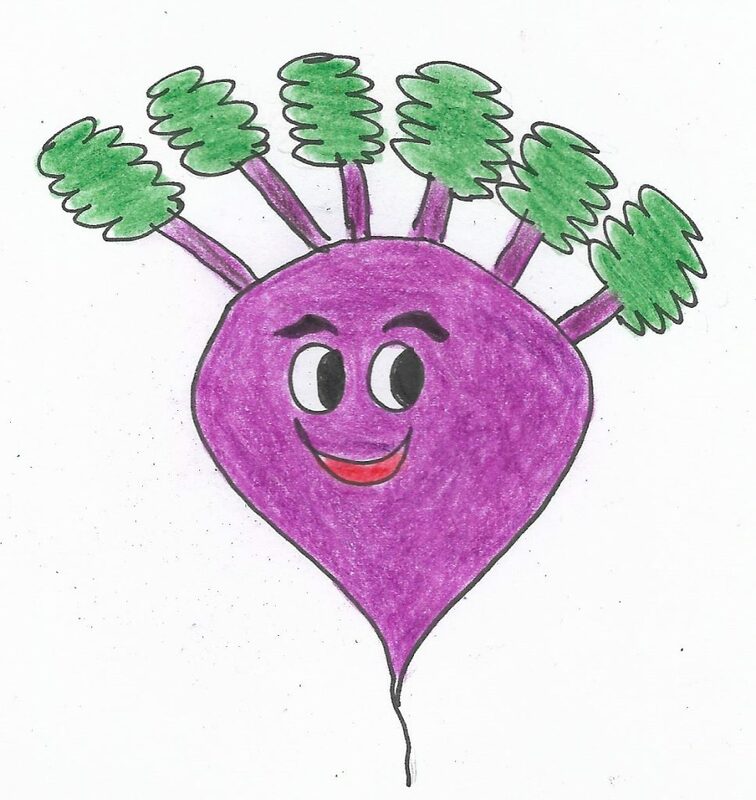 A Mental Health and Wellbeing project, AyeMind, (which inspired this blogpost after a presentation by Dr Trevor Lakey, Health Improvement and Inequalities manager with NHSGGC) developed by the NHS Greater Glasgow and Clyde along with partner organisations, has a fantastic website to be a part of providing positive mental health support for children and young people. Part of this was about digital inclusion, and using the tools, platforms and means of communications familiar to children and young people to engage and share. Part of this project was enabling talking about mental health issues in a positive, supportive environment and giving the children and young people a voice and opportunity to make better use of the Internet, social media and mobile technologies. 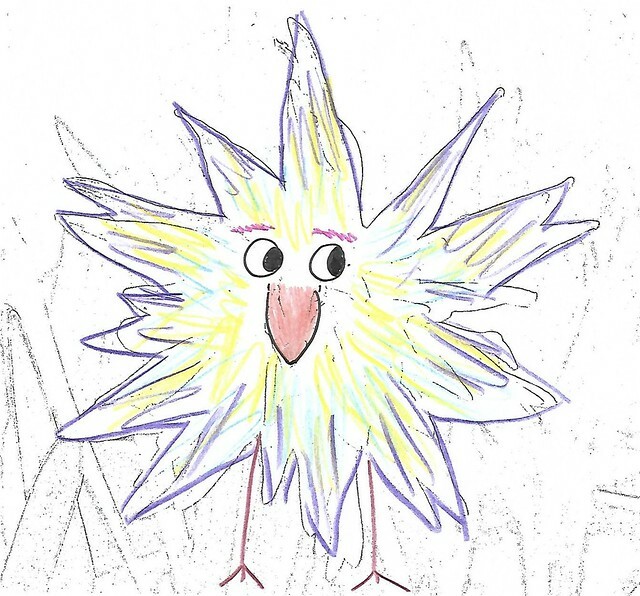 The memes and animated gifs on the AyeMind project website were created by children and young people as part of the project. There are a number of free online tools which let users create an animated gif. When using in an educational setting it would be prudent to check for suitability of advertising or galleries of user-created content which is rarely moderated. Ideally find a tool which just offers the tool for creation of the animated gif. Each tool which creates an animated gif may provide different options such as the limit on the number of images which can be uploaded, the option to control the speed or frame-rate of the animation, the size of the output animated gif image, and sometimes further options. Some simply provide the option for users to specify the location of an already uploaded video online, and the starting and finishing point for the clip animated gif to be created. The Young Scot website AyeMind project page provides an excellent outline of an activity for involving children and young people in deciding on the message they wish to convey and then shows step-by-step how to use either an online tool or a mobile app to create an animated gif. There are also plenty of example of memes and animated gifs created by children and young people on the Young Scot website AyeMind project page and an outline guide providing the steps to running a session with children, young people or adults on coming up with the ideas and then moving to making the memes or animated gifs. ABC.ya animator – aimed at being suitable for young children since it only permits drawn images or selection of pictures from an inbuilt galley of images. GifMaker.me – animated gif creator with several options from which to choose in controlling how the animated gif will be presented, and provides the option to add music or even combine several animated gifs. As with any creation tool it provides the opportunity to explore sources of images and content found elsewhere, to use only where permission is granted and attribution given as required. MakeAGif – provides the option to make a gif from an uploaded existing video or from an online source on YouTube, from which the specific segment can be selected. Be aware of the gallery of examples which would not all be appropriate for an educational setting. EZGif – provides the option for animated gifs from multiple images (up to 400) or from video. There is advertising on the site but no gallery of user-created content. Mobile device apps – many apps are available for smartphone or tablet to create animated gifs. Leslie Walker put together “Mobile GIF Guide: Make Animated GIFs on Your Phone” which lists several apps for mobile phones or tablet devices, along with descriptions of the features of each. Justin Pot gathered together “Making an animated gif is easier than you think with these which lists online tools as well as mobile device apps, including descriptions and guidance as to how to make use of each. Elise Moreau collated a list of free animated gif creators for mobile devices at “9 Free GIF Maker Apps for iPhone and Android” describing each and providing helpful hints as to how each can be used. Any image-creation tool (or a presentation tool like PowerPoint) on computer, mobile or tablet device can usually be used for creating an image meme – wherever an image can be placed with the facility to overlay text either along the top and bottom of the image, or within a border of black along the top and bottom of the image for white text to be superimposed on these black panels. There are online tools but as with any free online tool a having unmoderated galleries of user-created content has to be a factor an educator looks at in assessing the suitability of a tool in an educational context, however the following may provide the teacher with ideas, guides as well as inspire an adaptation of an existing meme to suit the learning need. Meme creation online tools include imgFlip Meme generator, MemeMaker.Net, MemeGenerator.net, and ImageChef Meme Maker (be aware that all of these have galleries of user-generated content which would not generally be suitable in an educational context but selected memes may be shared by a teacher for showing examples). Mobile device apps specifically for creating image memes have been collated on the AppCrawlr site “Best iOS apps for meme generator” and “Best Android apps for meme generator.” Mobile device users may well find they already have one of these apps as several have multiple purposes such as for editing images. This entry was posted in Professional and tagged animated gif, animation, art, Health and Wellbeing, Image manipulation, literacy, meme, Moving Image Education on 13 July, 2016 by Malcolm Wilson.